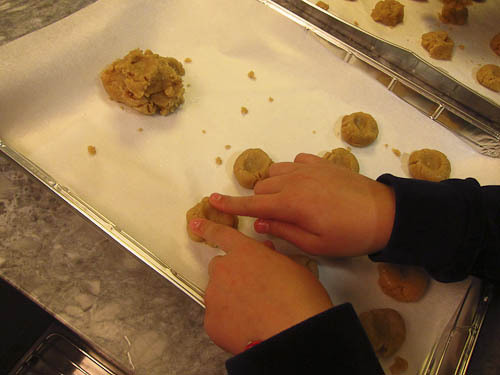 So this blog post is being forced upon me by my two nieces who have the perfect recipe and 4 hands to get these cookies done in thirty minutes. Thirty minutes from start to finish includes baking time, but not cleanup. They are kids after all. Combine all ingredients in mixer bowl. Fight over who gets to turn on the mixer. Insert carefully into the oven. 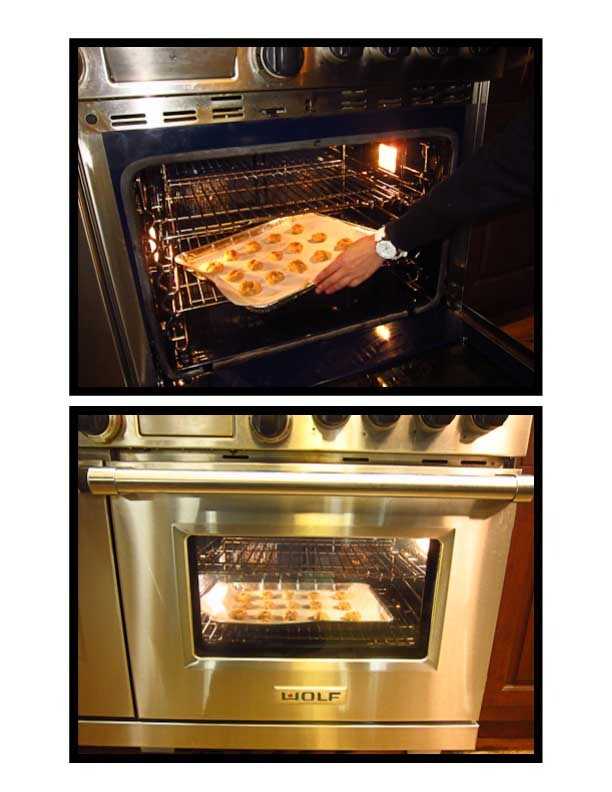 Bake for 20 minutes at 350 degrees. Remove. 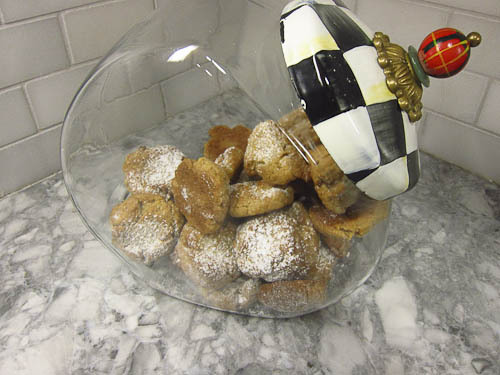 Sprinkle with some confectionery sugar and put it away in the Cookie Jar until Rosh Hashanah! My 10-year old son would eat hot dogs daily for breakfast, lunch and supper – if I’d let him. And certainly, on any given day, he is likely to come home from school or day camp and eat a hot dog or two for snack, before dinner is served a couple of hours later. 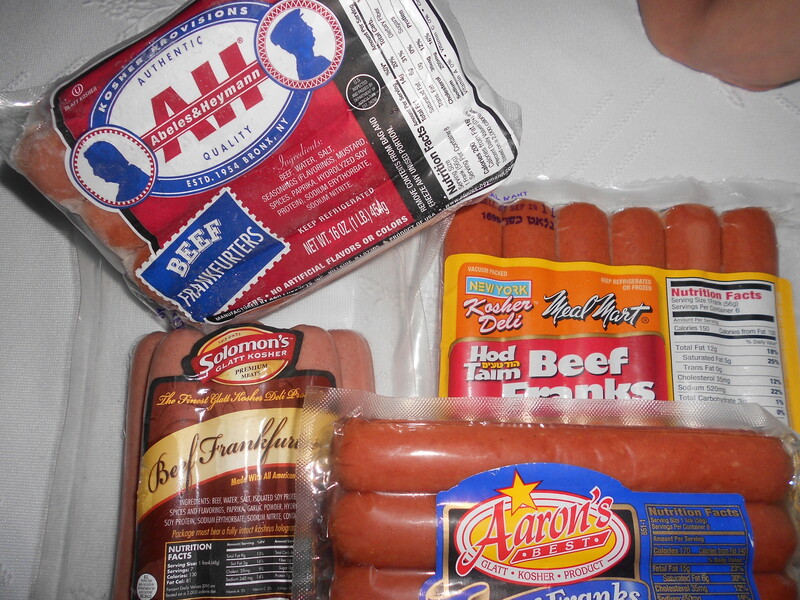 So I always have hot dogs in my fridge, and when my husband came home from Costco last week, with a package of Abeles & Heymann hot dogs, which is known to be a top of the line frankfurter, I decided to do a testing of several brands to see if it is indeed “the best”! 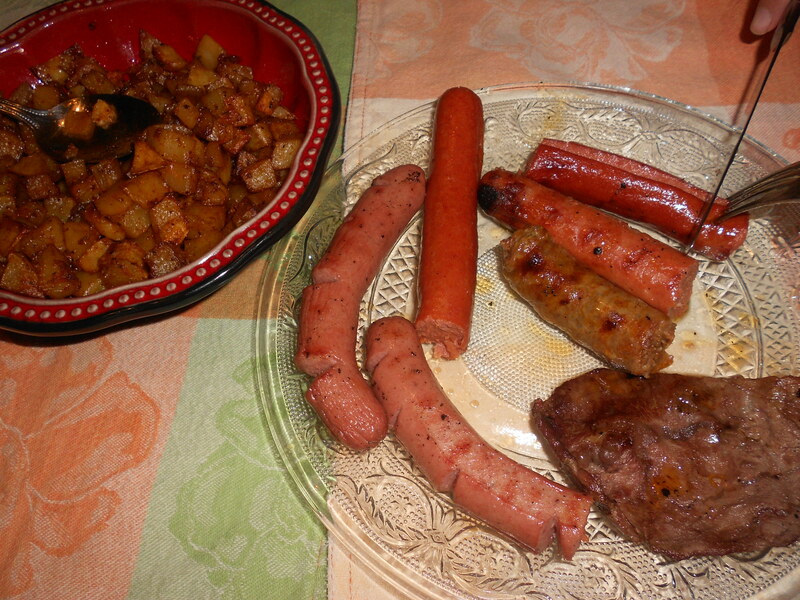 We compared 4 different brands, all of which were kosher beef frankfurters. There was Aaron’s, Abeles & Heymann, Meal Mart and Solomon. All were 2 oz. hot dogs except for Solomon’s, which was less than 1 3/4 oz. All 5 tasters agreed that Aaron’s was the #1 tasting hot dog. Firm in texture (it was also the thinnest hot dog), it had a nice smokey flavor, which did not disappoint. 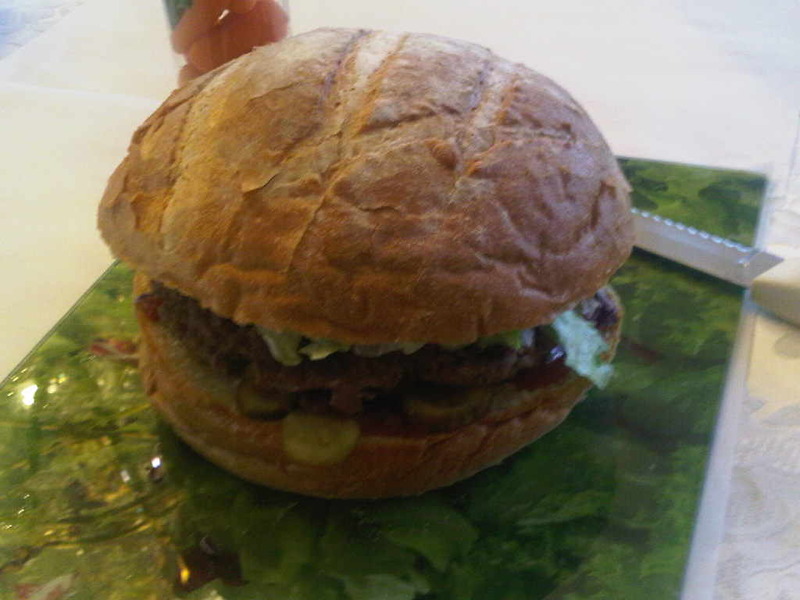 Abeles & Heymann came in second, more for it’s plump, juicy texture than for its’ flavor. Solomon, had the lightest color, and came in a close third – with its’ hot dog also having a nice texture and flavor but somehow lacking a bit of oomph. Surprisingly, the Meal Mart hot dog came in fourth, and was unremarkable. After we tasted, we ate, and realized that, after all that, once the hot dog is in the bun, with all the trimmings, it was hard to differentiate one from the other! In addition to s ome of the hats I wear, I help to arrange a retreat for women, to benefit Keser Kavod, an organization that provides hairpieces for men and children with illness and hair conditions. Our Winter retreat is an event that many women look forward to. A good part of the camaraderie that unites these women of different ages and diverse backgrounds can be attributed to our star speaker, Mrs. Miryam Swerdlov. In her very real way, with immense depth and witty delivery, she captures the essence of who we are and gives us the encouragement to accept and appreciate what we have, and to move on with our lives. “Look at life through the windshield, not through the rear view mirror”, is a typical Miryam phrase. So, we had our retreat February 22nd of this year, at which time Miryam invited us to her home for her upcoming Yom Holedes (birthday) on the 22nd of Adar. 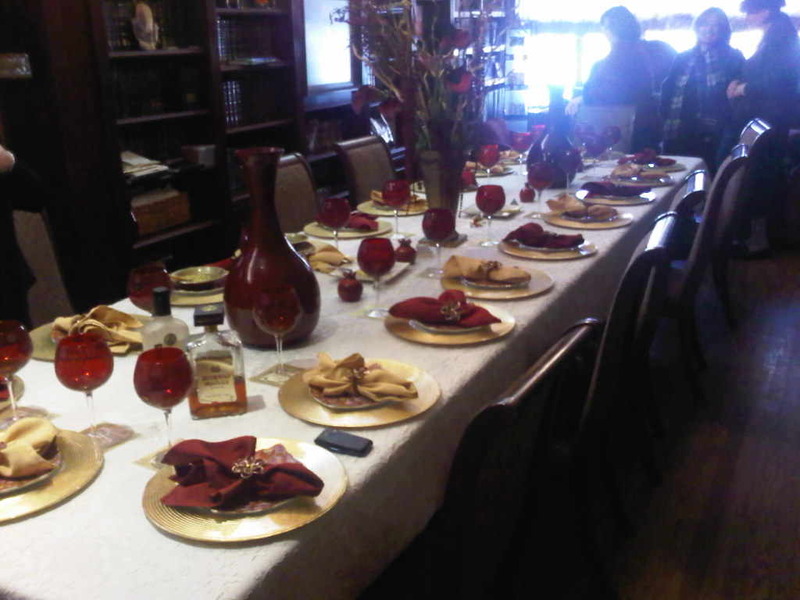 About 20 women showed up at her Crown Heights home yesterday afternoon, coming from Lakewood :), Boro Park, Flatbush, Williamsburg, Monsey & Monroe. We can always count on our nucleus, the core of our group – the women that come with us year after year, to show up. 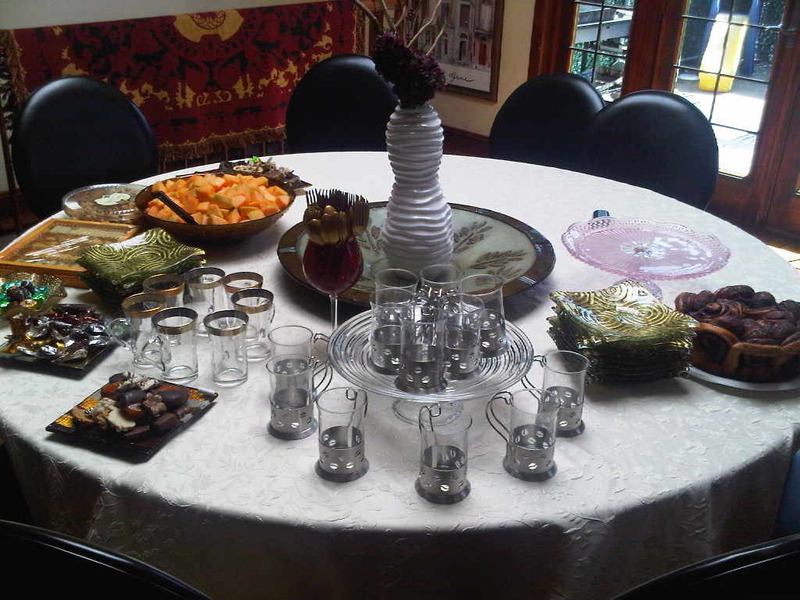 Miryam, single-handedly, set a beautiful dining room table, and transformed her kitchen island into an elegant buffet of food, even as dessert eyed us from the kitchen table. 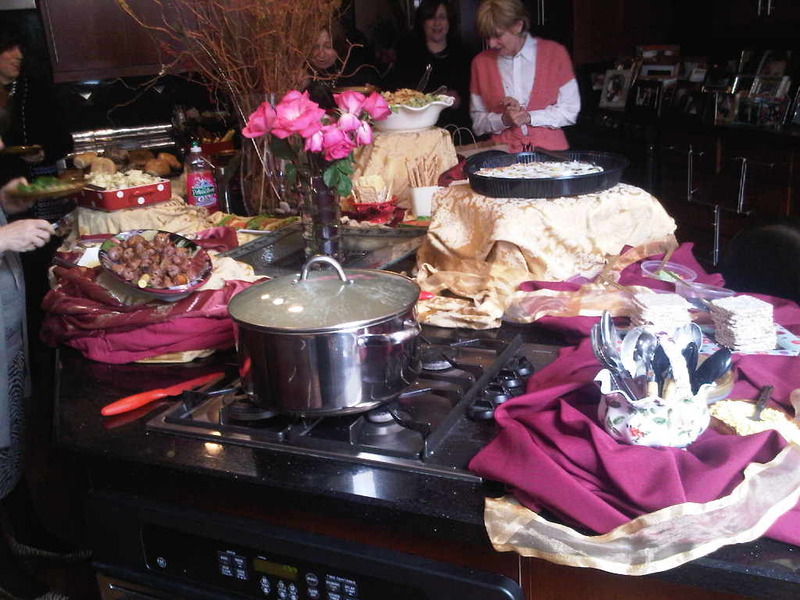 We served ourselves from the wide array of food in the kitchen, which we carried to and ate in the dining room. 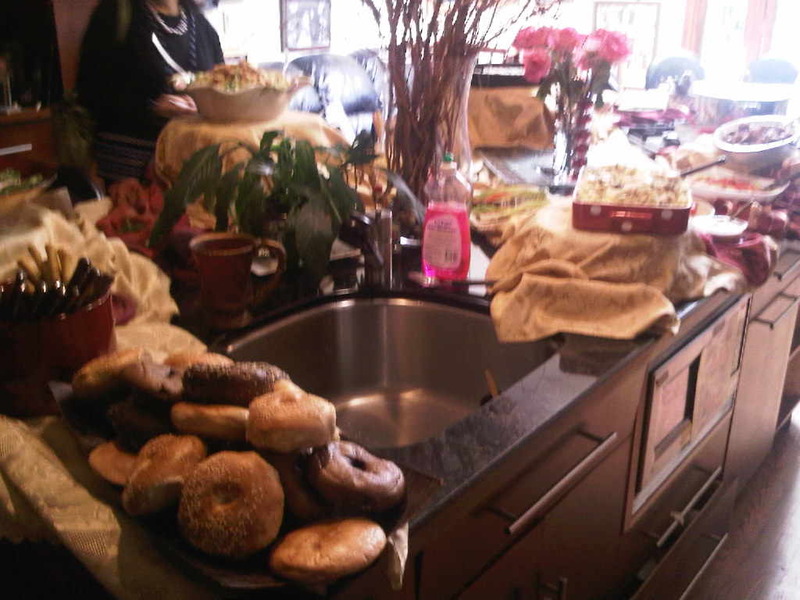 There were beautiful salads, sushi, bagels, lox, tuna & egg salad, roasted potatoes, hot soup, cabbage & noodles, and several types of crackers and breadsticks. While we ate, we heard inspiring music from Morah Music, interspersed with words of wisdom and chizuk from Miryam, and spontaneous dancing. I had this grand idea to order a bread in the shape of a large bagel to fill with deli meat and serve at the Purim Seuda. Somehow, the bakery misunderstood and made me a large 12″ round bread without a hole! Well, it was no longer suitable for a deli sandwich so yours truly got out some chopped meat and made a super huge, fabulous, hamburger!! I fried it in a frying pan while I cut and filled the bread with lots of ketchup pickles and lettuce. 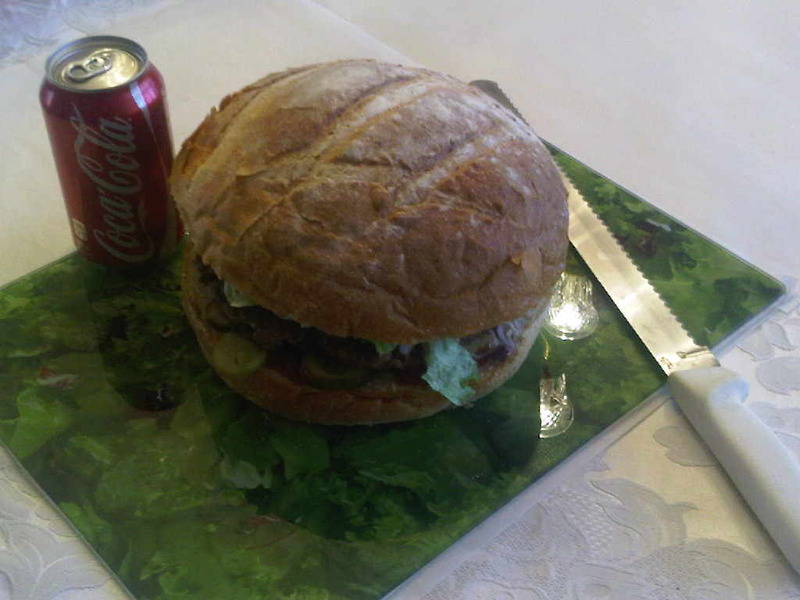 The massive burger was cut into wedges and was the talk of the table! I was quite organized this week so I got all my baking orders for Purim and deliveries out of the way. Today, Tannis Esther is a nidcheh (pushed off) as it is usually a day before Purim (Shabbos this year), and we do not fast on Shabbos unless it is Yom Kippur. So that leaves me with a free day to make what I’d like for the breaking of the fast tonight, and for Purim. My plan today is to make hamantashen, which I have only made once in my life when I tried it in a dairy variety, dairy chocolate bobka and rugelach and Aranygaluska. Wikipedia defines Aranygaluska as Hungarian sweet dumplings. In actuality, it is balls of a rich yeast dough dipped in oil and rolled in ground walnuts. 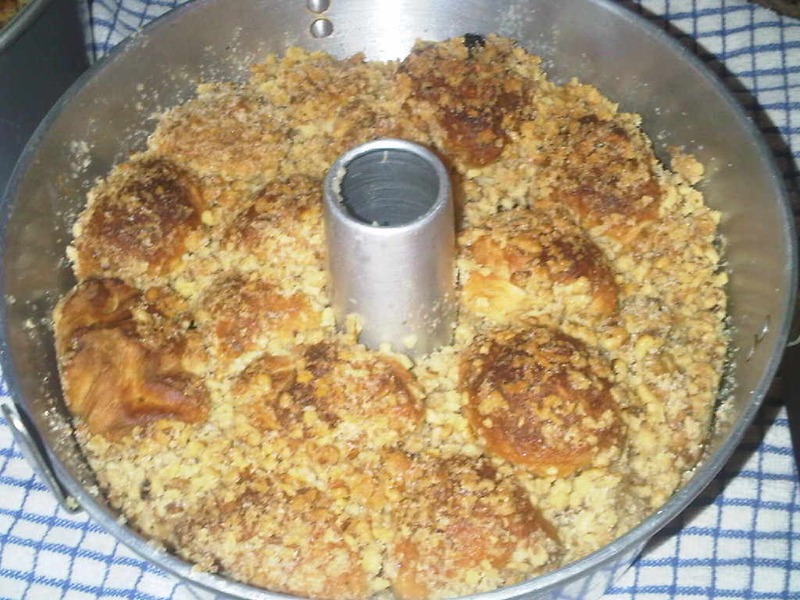 It is then layered and baked in a tube pan and traditionally served (at least in homes of Hungarian background) on Purim. We always had a (slightly overbaked ;)) Aranygaluska straight out of the oven on Purim. It is similar to monkey bread in that it’s eaten “pull-apart” style as opposed to in slices. When I googled Aranygaluska, I saw a picture of one which had lekvar (prune jam) filling in each ball. Although not authentic in my mother’s home, I think I will make it that way today since I love the lekvar filling and look for opportunities to use it. 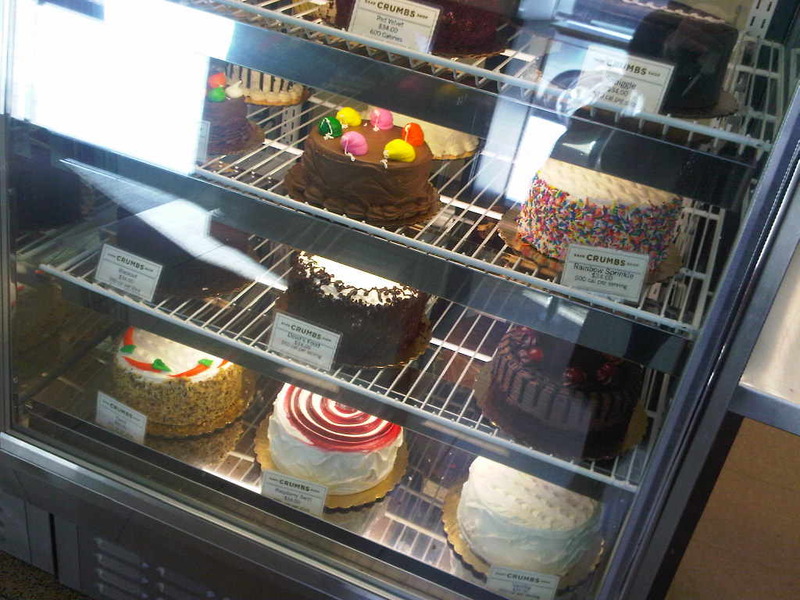 I think the best option for a fresh cake, would be to freeze it raw and then thaw and bake it fresh on Purim morning. 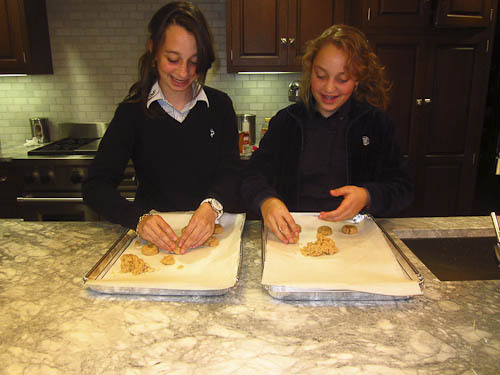 This is a recipe that was printed in Mishpacha’s Family First Magazine in the March 5, 2008 edition. I tried it that year and must have been in one of my organized moments, because I found it just where I thought it would be and in a protective plastic sleeve. I am glad I was able to find it now. 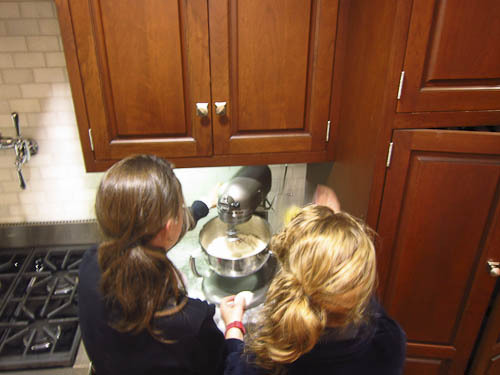 Place the flour, margarine, and sugars into a large bowl. In a smaller bowl, pour the lukewarm water over the yeast and wait 2-3 minutes. Add this to the flour, along with the apple juice, egg yolks, and salt. Mix together until it forms a dough. The dough should be soft and pliable. 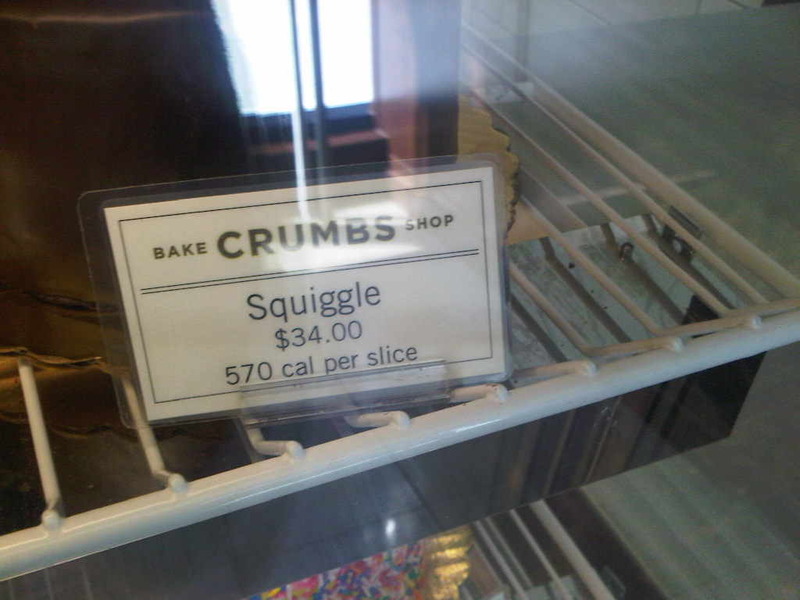 Tranfer the dough to a bowl sprinkled generously with flour. Cover and let the dough rise for 45 minutes. 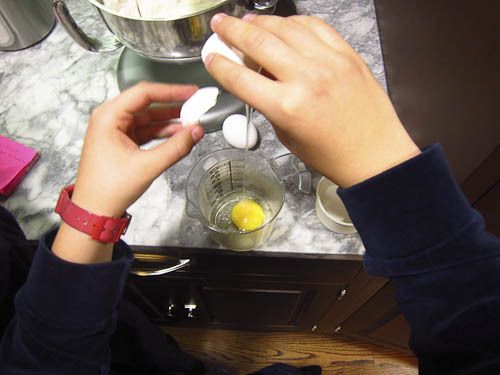 After the dough is risen, transfer it to a work surface and roll it out gently to a 1/2-inch thickness. 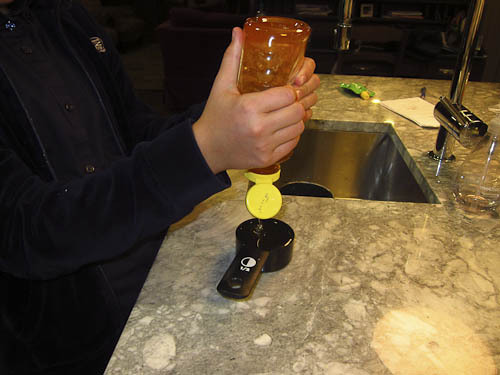 Use a glass with a 3-inch rim and cut out circle. Cover the circles and let them rest for 15 minutes. Prepare two bowls. Pour some oil into the first; in the second one, combine the walnuts with the sugar and vanilla sugar. Lightly grease two tube pans with removable bottoms. 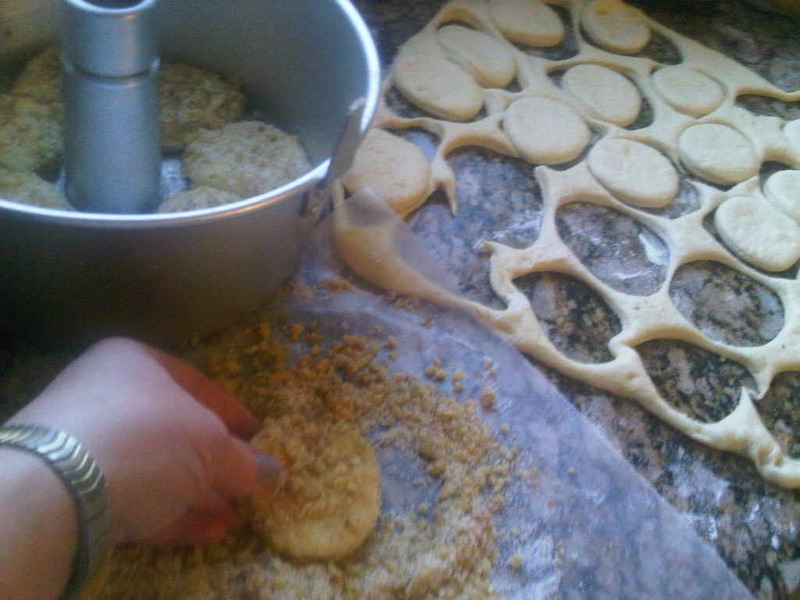 Working quickly, dip the dough circles into oil and then coat them with the nut/sugar mixture. Put the coated balls inside the pan to form layers. Sprinkle additional nut mixture on top of each completed layer, until you have three layers in all. The cake should reach about 3/4 of the height of the pan. Repeat the same process with the second pan. 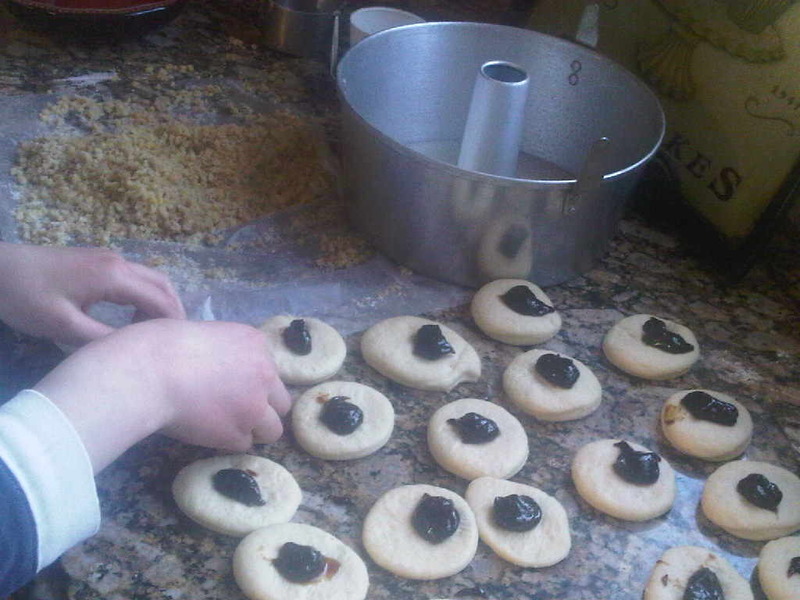 If using lekvar filling, put a teaspoon or two of the jam in the center of each round. form into a ball, enclosing the filling. Then dip in oil and nuts and described above. Rise 30 minutes. Bake for 45 minutes. Let cool. Use both hands to carefully remove the cake from around the tube. Serve whole on a cake plate, and expect the balls to be pulled apart for eating. To a Brooklyn girl like me, Manhattan will always be known as “the city”. How I love the city! I love the noise, the excitement, the hustle and bustle, the shopping and the shops. I had to be in Manhattan briefly today and found a parking spot within a block of my destination. 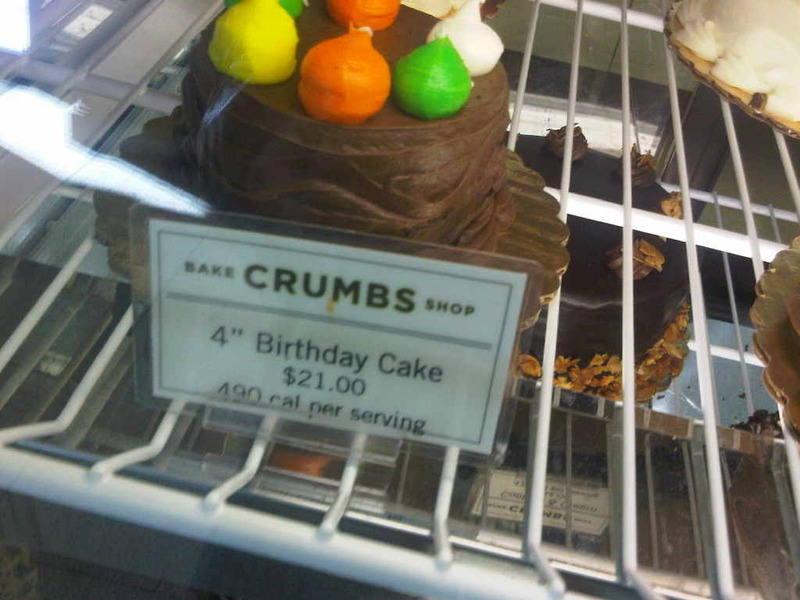 I struggled with the muni meter and noticed I had parked in front of a bake shop called “Crumbs” on Amsterdam and 77th Street. This area is traditionally known as the West Side. I made a mental note to check out the shop before heading back to New Jersey. The sign in the window said <strong>CUPCAKES, Made by hand, baked with love</strong>. 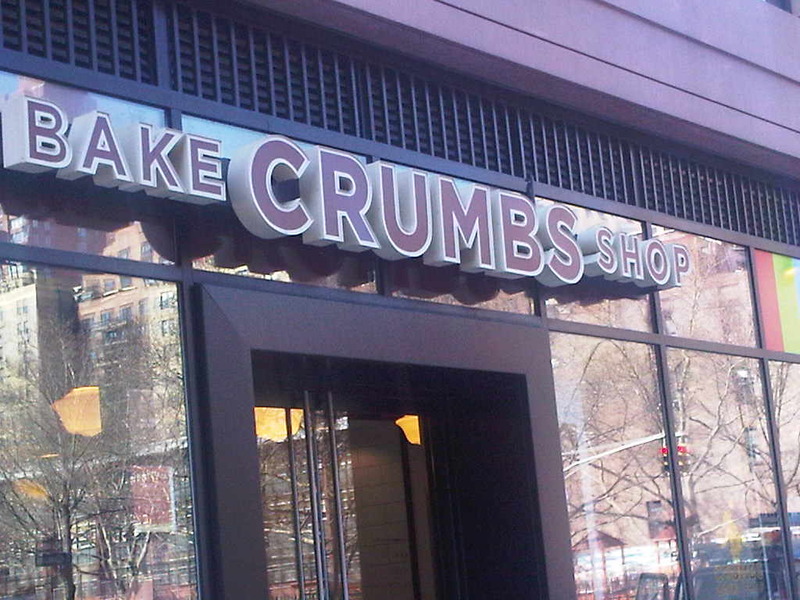 Little did I know that this was one of close to 20 stores bearing the Crumbs name! An hour later, as I stepped into the store to view the selection, I noticed an orthodox kashrus certificate in the window. I called my friend Y. who lives on the West Side to ask her about it and she said “some people eat there, and some don’t – just so you know, they are open on Shabbos”. I thought, ‘Ok, not for me, but at least I can walk in!’ . 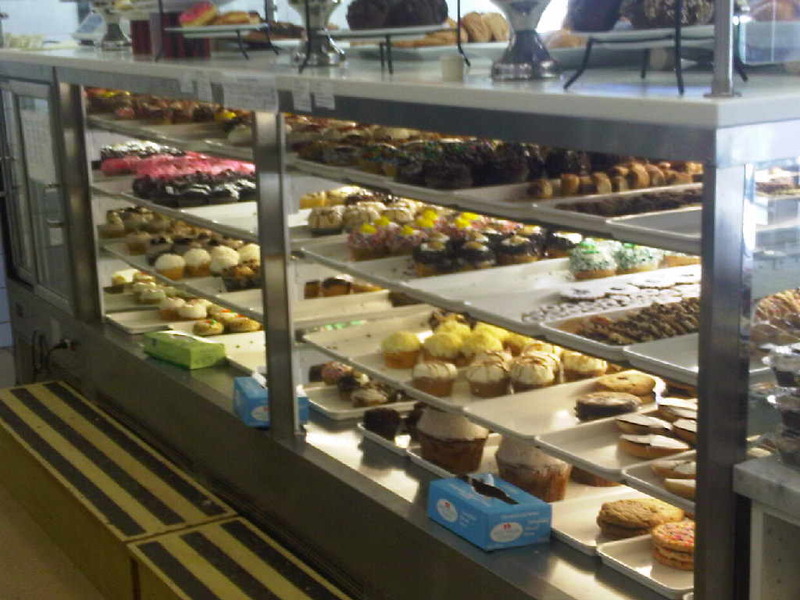 There was a nice long counter filled with the most appetizing looking pastries, each accompanied by signs with enticing sounding flavors, and the number of calories per serving! Now that is daring, but it doesn’t seem as though it affects business. the shop had a steady stream of customers some staying to sit and have a cup of coffee and others on the run. Some of the cake flavors included, Rainbow Sprinkle, Squiggle, Red Velvet, Black-out (one of my favorites), Carrot Cake, and the most adorable 4″ birthday cake with chocolate frosting and 6 deflated icing balloons on top. 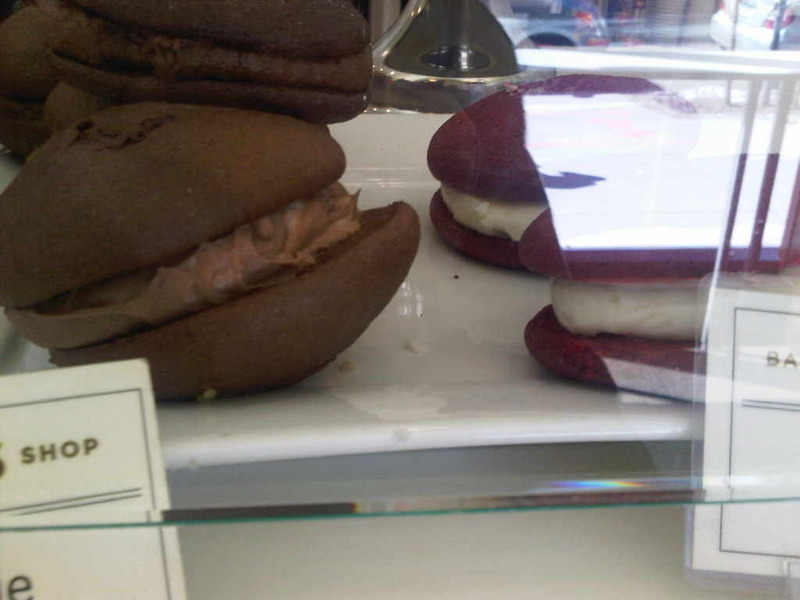 They had whoopie pies in Chocolate and Red Velvet, and cupcakes in innovative flavors and in 4 sizes ranging from the mini to the colossal. Naturally, I didn’t try any of these delicacies and although I was able to see their kitchen through the door, I learned that the pastries were not made on the premises but came from a wholesale outfit in the Bronx. Nevertheless, the store’s clean look and updated ambiance created a nice coffee shop atmosphere and I am pretty sure that the pastries were equally good. Our living room is usually not used during the week for casual entertaining. But I do like to sit on my couch to say tehillim and to daven. Today, my mother knocked on the door as I was saying tehillim and joined me on the living room couch. I offered her something to drink – a coffee or perhaps some carrot juice? She said she can’t “afford” (to drink) carrot juice. We shmoozed for a bit, when my sister-in-law E. happened by and joined us. 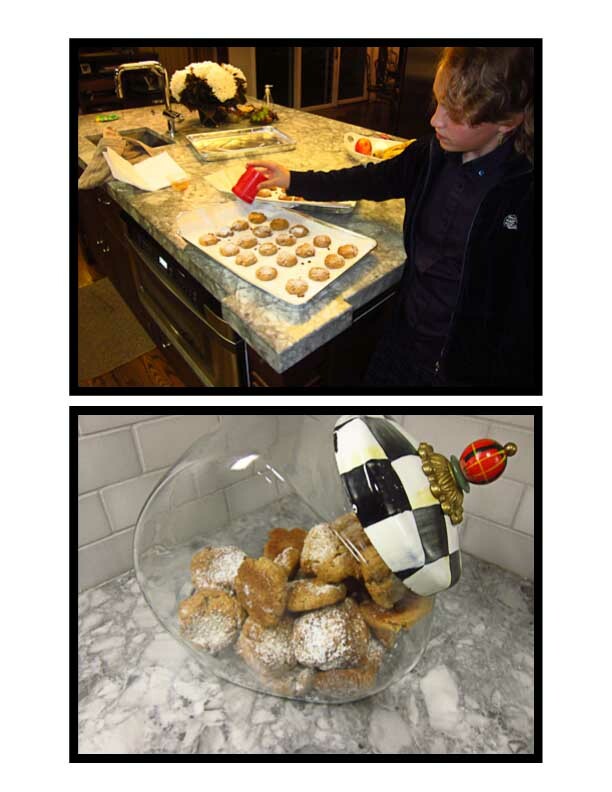 After a few minutes she went to “the cabinet” where unsellable baked items are placed for family enjoyment. You never know what you may find in “the cabinet”. It usually has biscotti, but today she found butter cookies. These are traditional Hungarian butter cookies or vajas pogasca. They are round cookies, about 1/2 inch thick, with a grid design on top, traditionally baked on a high shelf in the oven so it can bake through without burning the bottoms. They are dry with a rich buttery flavor, perfect with a coffee. Mom’s eyes lit up. “Now we’re talking”, she said and asked for a coffee to go with it. Isn’t it interesting that the carrot juice is “unaffordable”, but the butter cookies and coffee are fine! I guess the cookie just didn’t do it for E. or she had her mind on something else because she asked if I had any chocolate chip cookies. “Sure” I said. “In the last freezer on the left, on the second shelf , there’s a box which has an opening on top that will fit a hand. Please bring me one while you’re at it!” And that is how it happened, that on a random Sunday morning I entertained my Mother and SIL with cookies and coffee in the Living Room.